Sell to Us Price: $0.80 each. 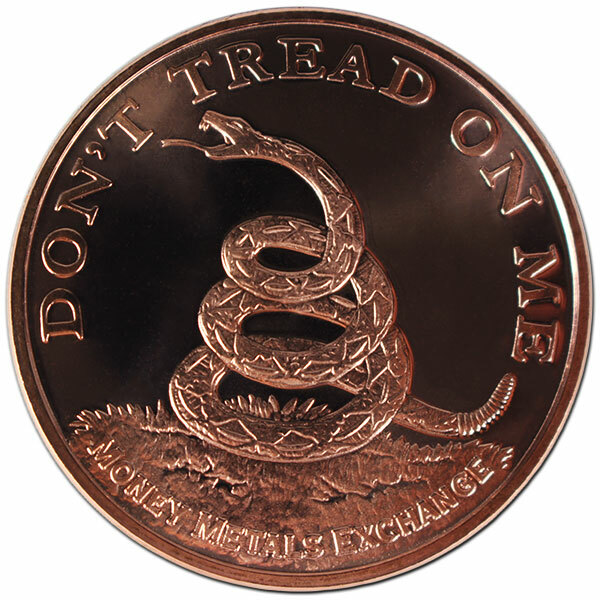 Money Metals Exchange is pleased to offer the popular "Don't Tread on Me" design on a pure copper round. 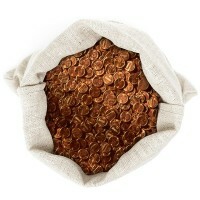 These beautifully made rounds weigh one standard (avoirdupois) ounce and are shipped in mint tubes containing 20 rounds. 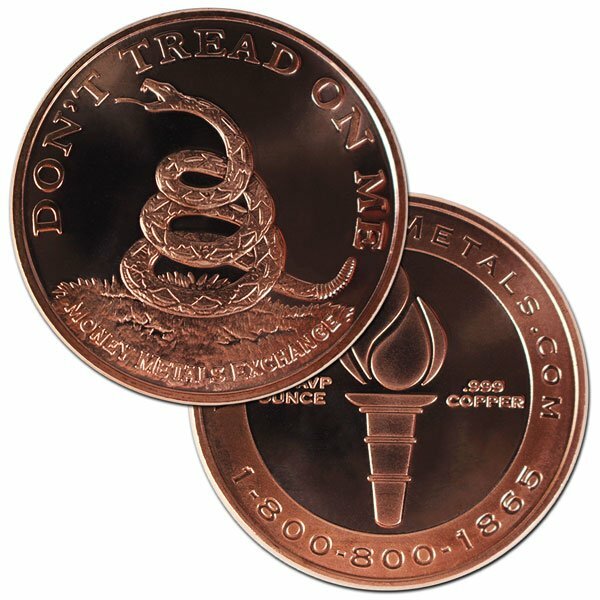 Money Metals Exchange commissioned these beautiful "Don't Tread On Me" copper rounds to provide a way for customers to accumulate pure copper in a form that will be easier to trade. And it is high time to reinvigorate the very symbols of Liberty upon which this nation was founded. These symbols are not to be denigrated and demonized as the highest levels of our political class are now trying to do. Instead they must be renewed, revered, and passed on to new generations who want the Founding Father's principles restored in modern-day America. In 1754, Benjamin Franklin first popularized the rattlesnake as a symbol of national unity during the French and Indian War. By 1774, it had become the formal symbol of the Freedom Revolution when Paul Revere added it to the masthead of his newspaper, The Massachusetts Spy, and showed the snake fighting a British imperial Dragon. In 1775, Continental Colonel Christopher Gadsden incorporated a coiled rattlesnake with thirteen rattles (symbolizing the colonies) above the motto "Don't Tread on Me" on an early American flag. Historians believe Franklin anonymously published the following of several arguments why the rattlesnake should be chosen as the symbol for America (rather than the eagle, which he amusingly opined was "a bird of bad moral character"). "She never begins an attack, nor, when once engaged, ever surrenders: She is therefore an emblem of magnanimity and true courage... she never wounds 'till she has generously given notice, even to her enemy, and cautioned him against the danger of treading on her." 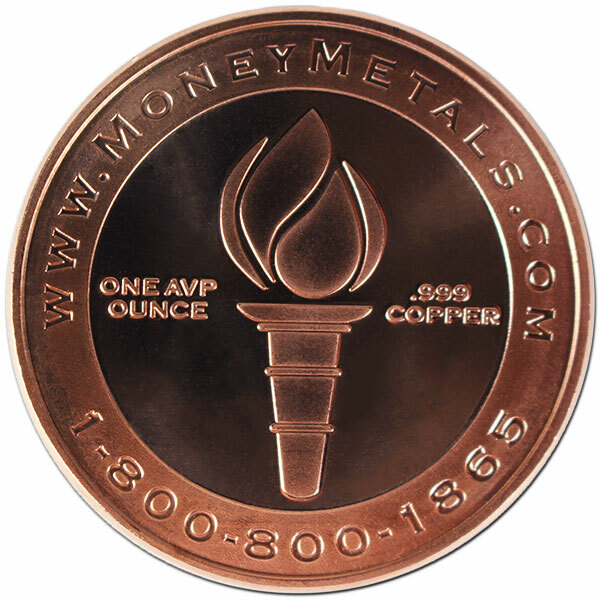 Our current buy pricing is $0.80 each and we will buy up to 1,000 ounces at this price. Simply call us on any weekday to lock pricing at 1-800-800-1865. Beautiful rounds, well struck. Thanks. I purchased these to start collecting some copper coins, but they were more than expected and I was very pleased with their appearance and beauty. 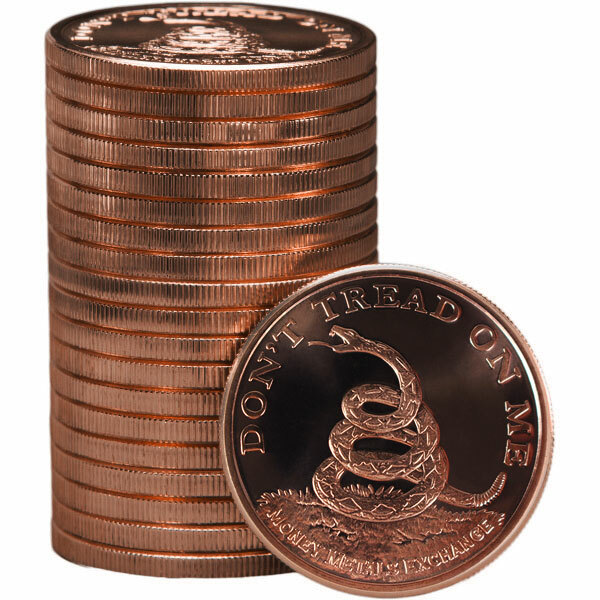 You can now sell your Don't Tread On Me 1 Oz Copper Rounds back to us online, at a price of $0.80 each!